If you spend anytime with Peyton you know she is theatrical. She also loves to take in live performances whenever she gets a chance. Typically we see plays but when the chance to see Moscow Ballet’s Great Russian Nutcracker I just had to jump on it. I’ve never been to a ballet either and have always wanted to. I had no clue what to expect but I was excited. When the big day arrived I dressed Peyton in an adorable dress and we headed off to the historic Orpheum Theatre. Once we found parking and walked through the freezing cold we were off to find out seats and settle in. We’ve been the Orpheum once before so I knew the lay of the land. But I had forgotten there are no buster seats here. So we rolled up our jackets for Peyton to sit on and that solved our little issue. As we waited for the ballet to start we looked over the program and I explained a little bit to Peyton what the ballet was and how it’s different than a play but also similar. Upon looking through the program it appears that the children in the play are local! How fabulous!! I didn’t even know we had a professional ballet center in the area but I think ti’s wonderful we do and I think it’s fabulous they are included in this performance. When the performance starts I was instantly taken in. I couldn’t believe we were at a ballet! Let alone the Nutcracker. But there was one thing I forgot to tell Peyton. The dancer do not talk. So she was sitting there waiting for the dancers to start talking. Finally she couldn’t take it any longer. She blurted out – “Momma, When are they gonna start talking?” I felt like everyone around us could hear her and I was a tad embarrassed. But the ladies sitting next to her just chuckled and whispered I was just thinking the same thing. Then I leaned over and explained to Peyton they do not speak. The dancing is the way they are communicating to us. Peyton gave me a perplexed look and just went back to watching the ballet. I could tell this was not sitting well with her. The first half of the Nutcracker was amazing. The costumes were breath taking and the dancers spot on. Oh and the music was heavenly! I was concerned that Peyton would want to leave during the intermission because there was no talking. But she surprised me. She was LOVING the ballet. During intermission we went out and looked over the souvenir table. It was full of Nutcrackers, Ornaments and much much more. We ended up taking home a beautiful blue Nutcracker. Peyton just had to have it and I knew there was no way we were leaving that table without him. After we purchased a few refreshments we wandered back to our seats. Peyton and I were pretty excited to see the second half. The second half was just as good if not better than the first half. I loved the little mice running around the stage. All the dancers did a fabulous job and were on top of everything. When it was time to go Peyton was sad. She really enjoyed the ballet. I enjoyed it too. 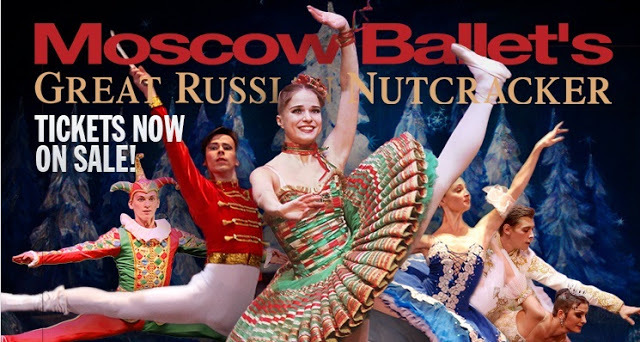 Connect with Moscow Ballet and see when they are coming to your town here. Follow the Moscow Ballet on Facebook, Twitter, Pinterest or YouTube to stay current with what happening. I would have loved to have seen this. My daughter owns a dance studio and my younger daughter teaches for her and all my grandchildren dance. So this would be right up our alley. They have performed the Nutcracker at a local theatre. I’m glad ya’ll got to see and enjoy it.. I would love to someday see a ballet…. This will have to go on my bucket list! I have always wanted to see a ballet!